If you enjoy reading, sharing ideas and getting together with friends, you might enjoy belonging to a book club or reading group. 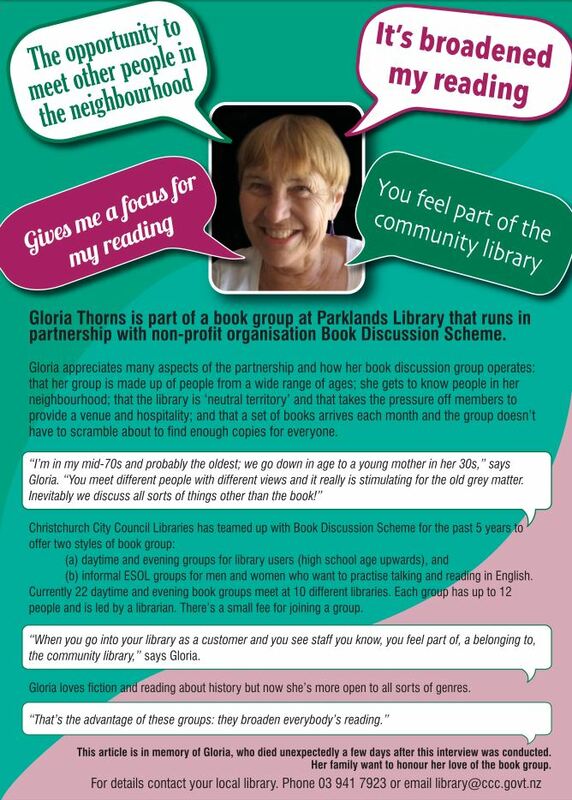 This page outlines the various ways in which the library can help and support your group. It also gives an overview of the different types of groups which are available, ranging from informal loose groupings of friends to more organised discussion groups, to online book clubs. Our libraries host two different types of book groups. Book Clubs are run independently by the libraries. They are more informal and there is no cost. Book Discussion Groups are arranged in conjunction with the Book Discussion Scheme, and a cost is involved. Love sharing your favourite reads? Come and join other book lovers in our friendly, relaxed library environment. Free, and no bookings required. Ōrauwhata: Bishopdale Library and Community Centre Two book clubs, one held on the second Monday of the month at 10am and the other on the last Thursday of the month at 1pm. 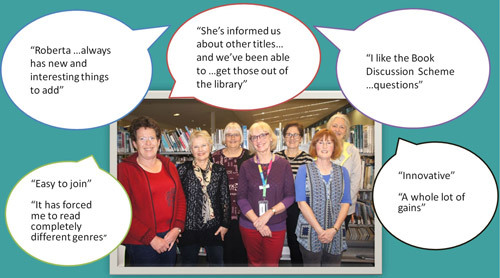 Fendalton Library Held on the first Friday of the month at 11am (while Fendalton Library is closed for repairs until Monday 29 July 2019, this book club will meet at Ōrauwhata: Bishopdale Library and Community Centre. Find listings in our events calendar. He Kura Pounamu Held at Tūranga on the last Thursday of the month 4pm to 5pm. Explore and discuss texts held in Waruwarutū / Ngā Pounamu Māori collection. Korean Book Club The Korean Book Club meets at Upper Riccarton Library on the second Friday of the month at 6pm. Come and share your ideas with other Korean book lovers. 에서 좋은 책과 그 책을 좋아하는 사람들을 만나세요. 매달 둘째 금 요일 오후 6시에서 7시까지입니다. Chinese Book Clubs meet at Upper Riccarton Library on the third Wednesday of the month at 6.15pm and at Fendalton Library on the second Friday of the month at 6.30pm. The Fendalton club will meet at Ōrauwhata: Bishopdale Library and Community Centre.Meeting Room 1 while Fendalton is closed (it reopens Monday 29 July 2019). Find listings in our events calendar. Young Adult Book Club - Tūranga Held on the last Tuesday of the month, 4 to 5pm. Friends of the Library Monthly Book Talks by local authors are on the second Tuesday of the month at Fendalton Library, 12.30pm. While Fendalton Library is closed until Monday 29 July 2019, the talks will take place at Papanui Library. Gold coin donation. No bookings required. Find out more about becoming a Friend of the library. Book Discussion Groups are for those who love reading and want to share in discussion with other friendly book lovers. They are arranged in conjunction with the Book Discussion Scheme. We subscribe to the Book Discussion Scheme so there is a cost involved. Places are limited. Please phone 03 941 7923 or email library@ccc.govt.nz to enquire about availability and cost. The books to be discussed are selected by the members of the group, so you will have significant input as well. Held on the second Wednesday of the month at 11am. This group will meet at Ōrauwhata: Bishopdale Library and Community Centre until Monday 29 July 2019, while Fendalton is closed. Find listings in our events calendar. Held on the second Thursday of the month at 6pm. This group will meet at Ōrauwhata: Bishopdale Library and Community Centre until Monday 29 July 2019, while Fendalton is closed. Find listings in our events calendar. Free, and no bookings required. Read a short book especially designed for ESOL learners for an ESOL book discussion group. Then come to the session and talk about it. The scheme helps those who wish to improve their English language reading and vocabulary in a relaxed fun environment, meet new people and get more confident with their conversation skills. There is a charge of $15 per year. Tūranga Held on the second Monday of the month from 10.30am to 12pm. Tūranga Held on the last Wednesday of the month from 5.30pm to 6.30pm. Upper Riccarton Library Held on the second Thursday of the month from 10 to 11am. In addition, if you are a library member, you can keep track of your reads and share your views of books by making full use of the library catalogue. The more informal gatherings usually read several books in a month and meet in members’ homes. In these book clubs the books are bought by the members. Or you could ask at your local library, where you are sure to get some help with your project. The more formal discussion groups usually read only one book per month and each member reads the same book. They meet in one another’s homes or in cafés around the city. Their books are loaned, but there is a bit of planning involved to ensure that everyone has access to the same book in the same month. If you decide that you want to belong to a group where members read the same book every month, a good organisation to contact is the WEA Book Discussion Scheme. They will help you join a group, set you up with all the reading lists you need and generally assist you to get yourself attached to a group. There is a growing number of online book clubs. Discussions can take place via websites, online communities, web forums or emails. Many focus on a particular audience, genre (e.g. romance, science fiction, mystery) or special interest. However, there are also several which take a more general approach.